Am I seriously talking about 2017 already?! I guess it's time to, seeing as there are only 11 days until Christmas! 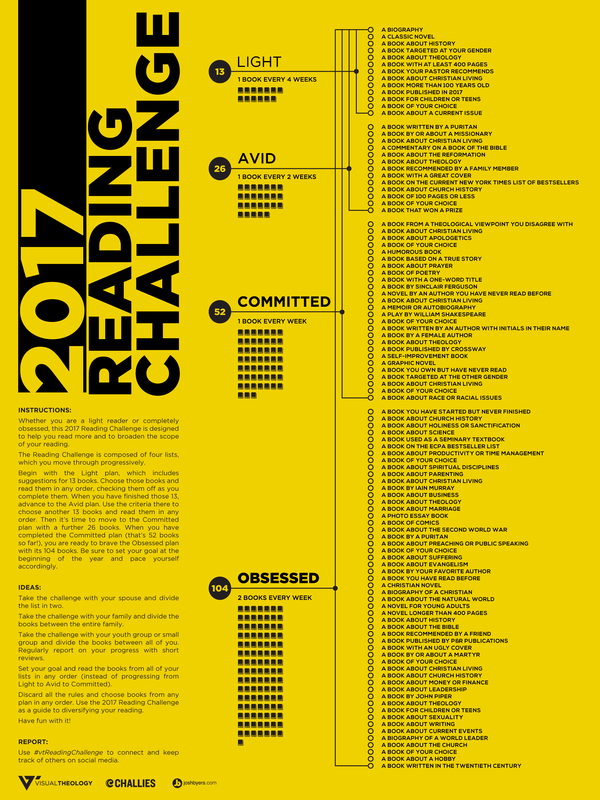 Anyway, I'm getting ready to participate in the 2017 Reading Challenge by Tim Challies. (Click here for the book list.) I will be posting every week about my progress, and I will do a brief review of every book that I read. Is anyone interested in doing it with me? Or does anyone have book suggestions? I'd love to hear from you! Funny one, Davy. Real funny. :) You should be committed! Sounds neat! What level are you planning on doing? Wow, Katie!!! Good luck!!! This looks hard.....but so so good!!!! Can't wait to read about your progress!! !